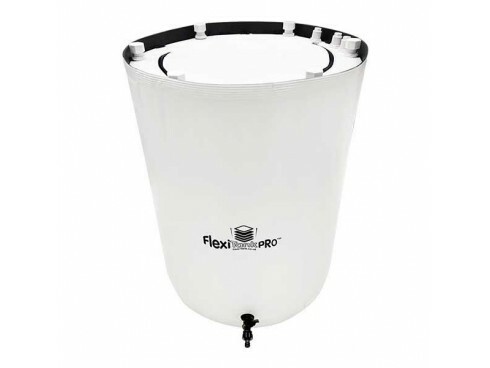 The Flexi Tank Pro 225L comes with all the benefits of a regular Flexi Tank, but features a stronger framework that makes it feel more like a solid tank once assembled. Not only that, this model is made with white, reflective material that helps to keep your nutrients within the right temperature ranges. It also features 3 x inlet / outlet grommets for your pipework, so it can be used with pretty much any grow system (including Autopots and IWS Systems). 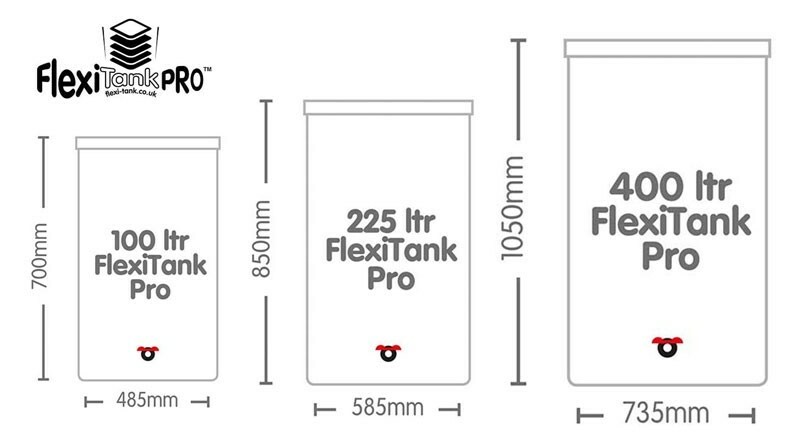 Flexi Tanks have been around for years now, and have earned the trust of an army of growers. It took a while to get people to ditch their solid tanks, but once you try a Flexi Tank, there’s no going back. They get the job done exactly as they’re supposed to, but they’re much more convenient to move around than regular tanks. The Pro version has been designed after factoring in years of customer feedback and is easily the best quality collapsible tank on the market – nothing else comes close. 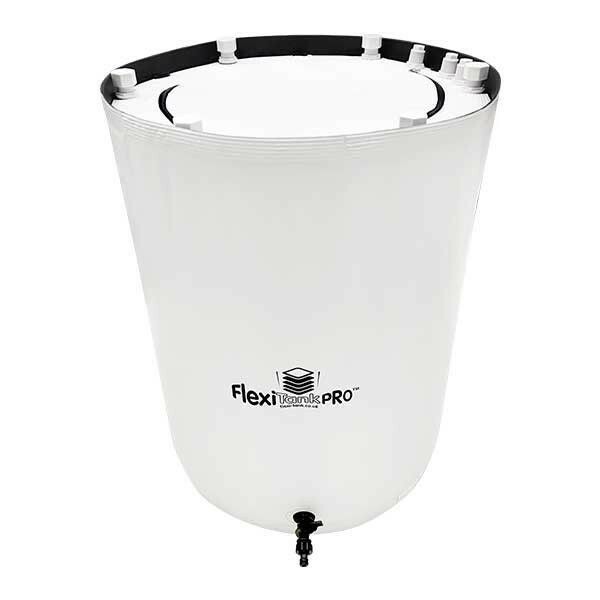 The white reflective skin on the Flexi Tank Pro helps to prevent nutrient temperatures from increasing, which is a particular issue in the summer months. When temps creep above 21 degrees celcius, nutrient solution loses its ability to hold on to dissolved oxygen. With reduced oxygen levels, plants are particularly vulnerable to root diseases, like pythium. 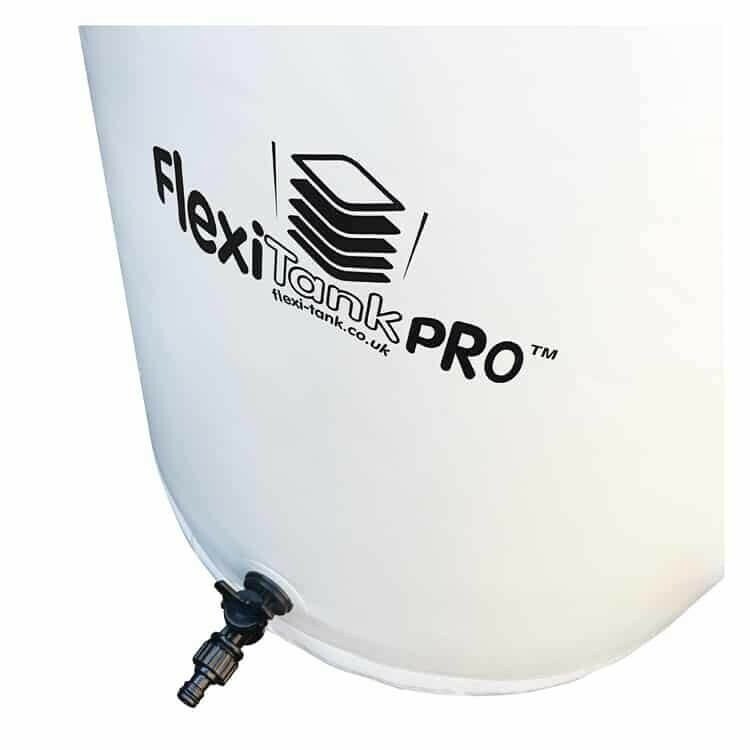 Switching to a Flexi Tank Pro is one of the things that you can do to help avoid the problem in the first place. It comes with a tap on the front and three inlet / outlet points with grommets for your pipework, making it incredibly versatile. You can fit standard 13mm (internal diameter) IWS pipework straight through, making this tank compatible with pretty much any type of grow system, whether it's an Autopot, a Flood & Drain or an R-DWC. If you want to use larger pipework, you can do this by screwing on an adapter. If you don't need these grommets at all, just use the supplied blanking caps to seal them off instead. Inside the lining are fill-lines marked in 10 gallon and 25 litre increments. Use these fill-lines to establish the volume of nutrient solution in your tank. This will, in turn, allow you to administer nutrients at the correct concentrations. Features: Ultra-strong – without question the sturdiest Flexi Tank you can buy. Manufactured with a highly reflective, light-tight outer skin. Helps to reduce the temperature of your nutrient solution, maximising oxygen levels. 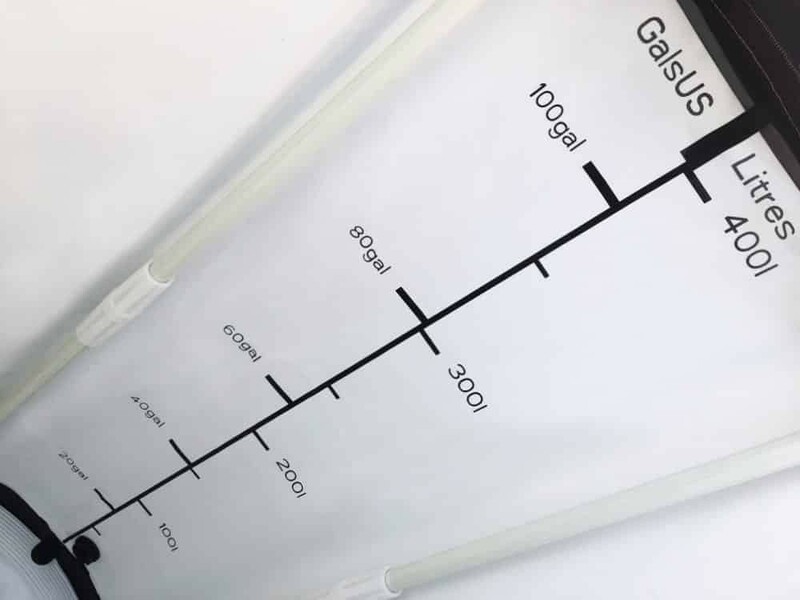 Features internal fill-lines that make it easy to guage levels of water or nutrient solution. Can be packed away into a small space. Much easier and more discreet to transport than regular solid tanks. Gets into areas that solid tanks won’t fit, such as through loft hatches, etc. Includes a zippered lid and access points for your pipework. Comes with a click-fit tap to make it easy to attach hose or connect to an Autopot system. m Supplied with a hand spanner for tightening up blanking caps. Lined with internal fill lines.